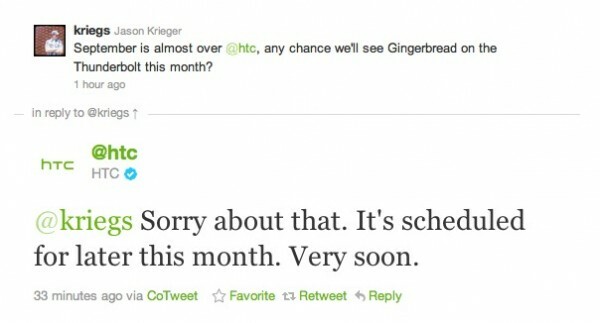 With just 4 days left in the month of September, HTC’s Twitter account assures us that the Gingerbread update for the Thunderbolt is still on the way. After seeing a couple of RUUs leak for the device over the past few days with just slightly different build numbers, it at least appears on paper that we are close. Verizon has a reputation for being extremely thorough in their reviews of these builds though, so I can’t help but remain a little skeptical at this point. Glad to see they have faith.